If we combine the results of the previous sections, a torque speed plot results as shown below. The arrows indicate the load curve with the circle as point of maximum load power. The Safe Operating Area shows the limits of operation due to motor specific parameters such as the maximum torque and speed. 1. Determine the load curve and the point of maximum load power. 2. Determine the duty cycle d (the percentage of the time that torque is required) and estimate the corresponding Td line with help of the shown T100, T50 , T25 and T10 lines. • The load curve is completely beneath the Td line (no overheating). • The complete load curve is in the Save Operating Area. 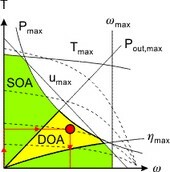 • The point of maximum load power is in the Desired Operating Area. • The point of maximum load power is as close to maximum voltage line as possible (we want to choose the smallest motor that can do the job). • The load curve is as much in the Desired Operating Area as possible.